1. Trying to seam 2 or more pieces of poly together. This is sure to cause you more headaches and grief than you could possibly know. Leaks, Leaks, Leaks. 2. Not understanding the slope where you have positioned your rink frame. Many issues would develop from this including # 7 below. 4. Fastening the liner to the inside of your outdoor rink frame before the water gets added and not allowing the liner to settle into the lay of the land previous to fastening. As your liner settles and drops down into all low points it would then rip off of its fastening staples or strapping and now all fastening holes are likely below the water line with your water draining out. 5. Not doing enough research and trying to install your Ultimate Rink in a hurry because there is cold front coming. The result: Almost every mistake discussed here. 6. Too many beers causing carelessness and damage to the liner, due to dropped tools, walking on your outdoor rink poly or dragging across the rough ground or the cement garage floor. 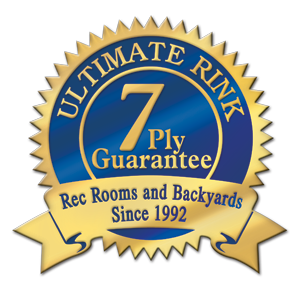 Friction tears, punctures and rips to the most important piece of your Ultimate Rink success is not a good scenario. Take care of your most valuable asset, your 7 ply liner. 7. Many rink builders build their frame and turn on the hose and walk away for the fill. After all it does take many hours. If the rink site is more sloped than the rink builder thinks, when you return hours later the entire end may be missing as it “blows out” due to the massive water weight as the depth of water rises in their deep end. You will need to monitor the filling process. Please, for your sake, don’t add lines to your rink for a pro look unless you have complete shade from the sun. The sun attracts to your dark lines and causes solar melt on your outdoor rink surface where there is anything dark like lines, leaves, pine cones etc. This would mean that a slushy mess is created and your skating surface ruined where your lines have been added. If you have complete shade in your rink building area, lines are an sweet addition. And one last thing. If you need to somehow level your site or your outdoor rink frame because you have misjudged the outdoor rink slope or grade in the area that you have chosen then, please, please, don’t use snow. Suffice to say snow melts during mild conditions. 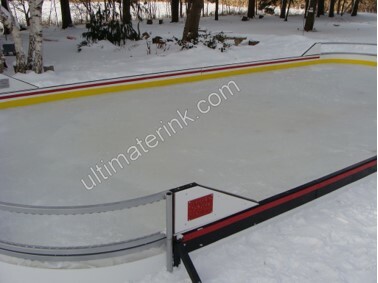 You would use the Amazing 5 in 1 Rink Stake that literally gives you rink building freedom when you install “Ultimate Rink” from the beginning. Almost all ice rink sites have a section or an area where one end or side is lower than another. You may even find opposite corners that are lower. A successful rink builder needs to identify the above scenario. The builder needs to determine their extra Rink Stake 5 in 1 placement for frame support where it holds the deepest water. Find your level by using a transit (if available) a laser line level or a string and line level. Once you have determined the grade, slope or level of your site, here is the easy calculation for what extra Rink Stake 5 in 1 you will need. The deeper your water the closer your Rink Stake 5 in 1 support system needs to be, then gradually widen spacing towards shallow end/high end of slope where there will be less water. Monitor your filling water depth if it’s your first time. If in doubt always order extra 5 in 1 Rink Stakes, spikes and Support 45’s. Do not underestimate the weight of the water pushing out from the inside of the boards previous to freezing. 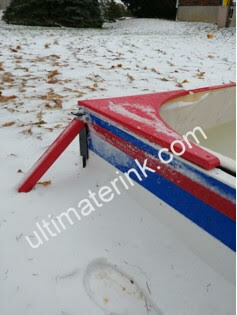 The deeper the water/ice the closer your 5 in1 Rink Stakes need to be. Extra bracing will secure your rink system and lead to your ultimate success. “You would rather be looking at them then looking for them” Happy to partner with you in your success.